Elisha the Prophet was the son of Shaphat of Abelmeholah. The earliest mention of his name is in God's command to Elijah in the cave at Horeb. 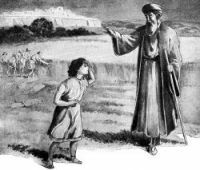 Elijah sets forth to obey the command and comes upon his successor engaged in ploughing a field. 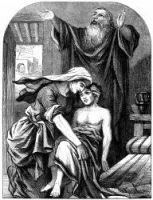 Elijah crosses to Elisha and throws over his shoulders the rough mantle--a token at once of investiture with the prophet's office and of adoption as a son. Elisha delayed merely to give the farewell kiss to his father and mother and preside at a parting feast with his people, and then followed the great prophet on his northward road. We hear nothing more of Elisha until the translation of Elijah, when he reappears to become the most prominent figure in the history of his country during the rest of his long life. After the purification of the springs of Jericho and the catastrophe of the children of Bethel, he later extricates Jehoram king of Israel, and the kings of Judah and Edom, from their difficulty in the campaign against the Moab arising from want of water. 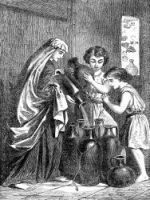 He then multiplies the widow's oil. 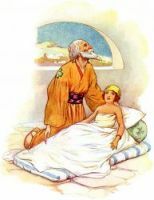 The next occurrence is at Shunem, where he is hospitably entertained by a woman of substance, whose son dies, and is brought to life again by Elisha the Prophet. 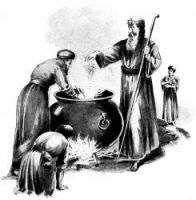 On this page you'll more images of Elisha the Prophet taken from my collection of antique Bibles and story books. You're welcomed to use these pictures of Elisha the Prophet in your artistic creations. 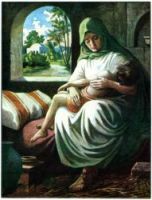 Click on the illustrations below to see more details about saving a free image or about purchasing the images of Elisha the Prophet at a higher resolution.